Without a doubt, getting a college education is expensive — perhaps costlier than at any other time in recent history. In fact, the national student loan debt stands at 1.4 trillion dollars, and this number continues to grow at an alarming rate. 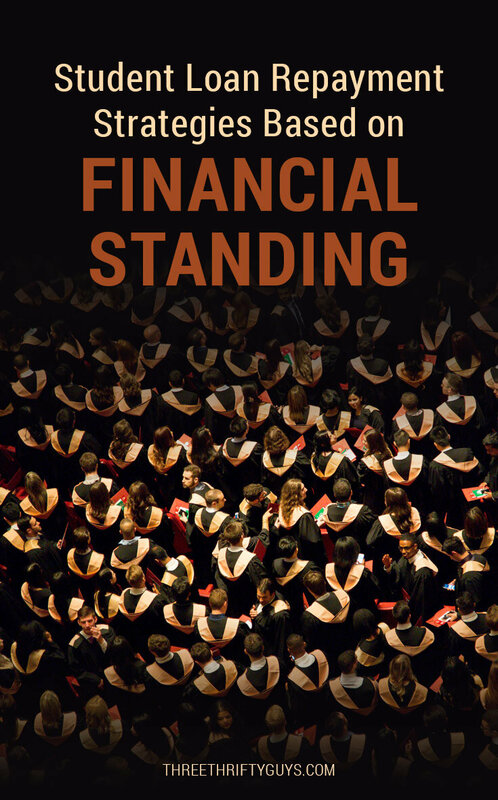 While many graduates are able to meet their financial obligations, others have a hard time making the minimum monthly payment. When I graduated from college, I had $25,000 in student loan debt — which left me feeling stressed and overwhelmed about how I would ever pay off my loans. I made a game plan, which included moving in with my aunt and uncle, and picking up freelance work on top of my full-time job. By putting every spare dollar towards my student loans, I managed to pay off my debt in 15 months. While my plan won’t work for everyone, there are many ways that people can pay off their student loans and keep their credit rating intact regardless of their current financial situation. With a number of repayment plans and strategies offered by federal and private lenders, there are options available for borrowers based on their financial standing. One of the most challenging positions to be in as a new college graduate is to find yourself without a job — and facing down your first student loan payment. If you are in a situation where you are struggling financially, either because you don’t have a job or because you have a low paying job, the good news is that there are options available for repaying your student loans that can preserve your credit and keep you from going into default. If you have federal student loans, you may be eligible for an income-driven repayment plan. This type of plan will cap your monthly student loan payment at a percentage of your monthly discretionary income, from 10 to 20 percent. However, the term of your loan will be extended from 10 years to either 20 to 25 years. At the end of that period, the remaining loan balance is forgiven. The immediate benefit of an income-based repayment plan is that your monthly student loan payment will decrease significantly. You may also have at least part of your loan balance forgiven eventually. However, you should be aware that because your loan term will be extended, you will end up paying more in interest over the life of the loan. In addition, you will owe taxes on any amount that is forgiven. Because of these two factors, income-driven repayment plans should not be utilized unless you are at risk of going into default on your student loans. If you have federal or private student loans, you may also consider seeking deferment or forbearance, which puts your loans on “pause” for a period of time while you are unable to make payments. Deferment allows you to not make payments on your federal student loans for up to three years if you meet certain requirements, such as economic hardship. If you have subsidized student loans, the government will pay the interest on your loans while in deferment. If your loans are unsubsidized, then interest on your loan balance will grow while in deferment, which means that you will typically owe substantially more money by the time that deferment is over. Forbearance is available for private student loans for a period of up to 12 months. It allows you to stop making payments for up to 12 months. However, interest will continue to accrue on your loans, which will ultimately mean that you will owe more on your student loans once the forbearance period is over. Our modest solutions for helping to lower the cost of tuition. If you have managed to land a job after college and are doing OK financially, you will do well by sticking with a standard ten-year repayment plan for your federal student loans. While your monthly payments may seem high, you will ultimately pay far less money by staying with this repayment term than if you extend your repayment plan to a 20 or 30-year term through consolidation or by picking a different repayment plan. Continue making your payments on your student loans, and when possible, put a little extra cash towards your student loans. Even an extra $25 can help you chip away at your total debt — and help you pay off your loans more quickly. If you are one of the lucky ones who landed a plum job after graduation — congratulations! With your higher salary, you have some options for how to repay your student loans so that you can get out of debt and start working on your other financial goals. With a strong income and credit score, you will likely be eligible for a low interest rate through refinancing. One of the best repayment strategies if you have private student loans is to refinance your student loans to obtain a low, fixed interest rate with a shorter loan term. While your monthly payment will likely be higher, you will save thousands of dollars in interest on your loan — and will pay off your loan much more quickly than you otherwise would have without refinancing. You can devote a chunk of your monthly paycheck towards your student loans and be out of debt much faster than you likely thought possible. For federal student loans, you can refinance the loans along with your private student loans. By doing so, you could obtain a much lower interest rate, but you will lose the protections of federal student loans, such as income-driven repayment options. For reference, private student loans are not eligible for any of the income-driven repayment plans offered by the Department of Education. Alternatively, you could pay off the student loans more quickly by putting extra money each month towards your student loan payments. This will help you keep the benefits of your federal student loans while working towards your goal of paying down your loans quickly. Ultimately, paying off your student loans is achievable — regardless of your financial standing. With a number of options available, you can choose a strategy that fits your budget and get started on your repayment plan today. Yeah, this is a toughie. There are income-based repayment plans, which is what I did at first. Unfortunately these aren’t that great at *actually* eliminating your student loans because the payments go straight to interest instead of principal. I was able to significantly increase my income and slash the hell out of my expenses, and that’s why now we’re able to put (on average) $3k on our student loans each month. $3k a month! Wow, you’re killing it.